Michelle Arrow reflects on the career of feminist activist Elizabeth Reid as part of VIDA blog’s series on Inspirational Women. Asked to name a famous women’s liberationist from 1970s Australia, most people would probably answer Anne Summers or Germaine Greer. Both wrote ground-breaking books and both were on the vanguard of the women’s movement. Yet social movements also need members willing to work within mainstream power structures to achieve change. Elizabeth Reid was one such activist. A member of Canberra Women’s Liberation and Senior Tutor in Philosophy at the Australian National University, Reid became the world’s first advisor on women’s affairs to a national leader when Prime Minister Gough Whitlam appointed her to his staff in April 1973. Reid was an idealistic pragmatist, bringing women’s movement perspectives to the work of government and making the state more responsive to women’s needs. She was determined not just to improve the basic conditions of women’s lives (childcare, health services, protection from violence) but to foster cultural change that would expand the possibilities of their lives. She was celebrated, denounced, mocked, and endlessly scrutinized. But she was also brave: for accepting such a controversial role, and for her willingness to accept the challenge the Whitlam government laid down for the women’s movement. 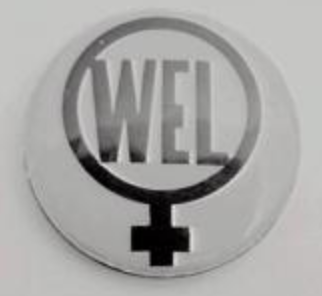 Women’s Electoral Lobby, circa 1972, circular tin plate with WEL Logo. Image via Powerhouse Museum. Whitlam had gone to the 1972 ‘It’s Time’ election with an ambitious policy platform, but only three reforms were specifically aimed at women. He promised equal pay for work of equal value; the removal of the sales tax on contraceptives; and access to preschool education for all Australian children under five. Yet the women’s movement was a growing political force, signified by the formation of the Women’s Electoral Lobby in the months before the election. 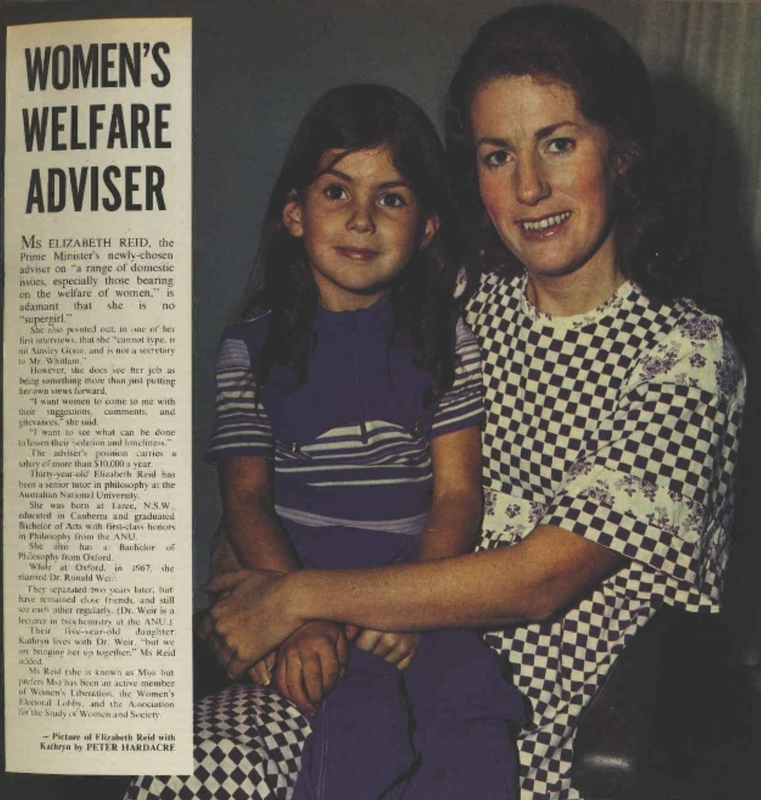 Whitlam responded to the emergence of a new constituency of women voters by advertising for an advisor on women’s issues. Around 400 people applied for the job. Reid felt a ‘moral obligation’ to apply for the job, which she thought would bring the women’s movement ‘inside the system’ to implement change.’ The press treated the search like a feminist ‘Miss Australia’ contest: the shortlisted applicants (including Anne Summers, Lyndall Ryan and Eva Cox) were described as ‘Gough’s supergirls’. Eighteen candidates were interviewed, and Elizabeth Reid was chosen. Whitlam showed courage in employing the highly intelligent but somewhat unconventional Reid to the position. She was an activist, a philosopher, married but separated, and her daughter Kathryn lived with her father. She withstood a barrage of sensationalist, deeply sexist media coverage of her life and opinions. She was either sensationalised as a ‘supergirl’ or rendered approachable through her motherhood and femininity. Reid emphasised both her privilege (as a white, middle-class woman) and her ordinariness, telling Michelle Grattan as part of an interview for The Age: ‘I have lived through a period as a wife washing nappies. At one time I worked scrubbing floors, cooking and working in shops to make money … So I have an inkling of the problems people face.’ Her clothing, appearance and opinions were scrutinised as the media tried to determine what shape a feminist life might take in 1973. 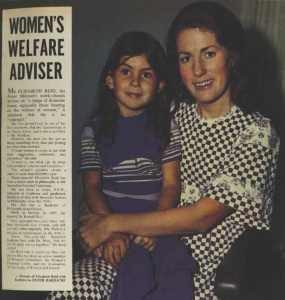 Australian Women’s Weekly, 25 April 1973, 3. With no female MPs in Whitlam’s first term, Reid became both the female face of the Whitlam government and an ‘official’ face of the women’s movement. The parameters of her job were opaque, but she needed the imprimatur of all women both within and beyond the women’s movement. So she travelled the country, seeking women’s opinions. They responded with hundreds of letters. Reid helped these women navigate a bureaucracy that was hostile to women and worked to make its structures more responsive to women’s needs. So what did Reid achieve during her time in Whitlam’s office? First, she was a dedicated proponent of new government funding for services that would benefit women: not just child care, but for services established by the women’s movement like women’s refuges and health centres. Her advocacy helped expand the role of the state in protecting women and advancing their rights. Second, Reid used her position to try to encourage cultural change. She was instrumental to the establishment of the Royal Commission on Human Relationships in 1974. The Commission emerged from a failed attempt to reform abortion law in the ACT and was tasked, ambitiously, with investigating the ‘family, social, educational, legal and sexual aspects of male and female relationships’. Reid saw the Commission’s potential to place private problems like domestic violence, sexual assault, abortion, child abuse, and experiences of parenthood on the political agenda. The Commission’s extensive recommendations articulated and anticipated a feminist reform agenda that would roll out across the following decade. Reid also secured significant government spending on International Women’s Year (IWY) in 1975 to change perceptions of women. She wanted IWY to empower women, undo the social norms and values that constrained them, and to strengthen their creativity. While the celebrations had an enduring ripple effect, more immediately they led to Reid’s downfall. The growing scandal around the national debt under the Whitlam government meant that IWY looked increasingly extravagant. One of the year’s signature events, the Women and Politics Conference, exposed divisions in the women’s movement. Women protested about East Timor during Whitlam’s opening speech and left the statue of George V in Parliament House festooned with bras. The press had a field day caricaturing the ‘rabble’, and by the end of the week, the damage to Reid’s position had been done. Whitlam’s commitment to Reid, and to women’s affairs had become a political liability. When it was suggested that she move out of the Prime Minister’s Office and head a women’s section in the public service, a move that would have reduced her access to the PM and diminished her power, she chose instead to resign. Reid fled Australia after her resignation, working in development in Iran and Africa before returning to Australia in the mid-1980s. She was critical to the development of Australia’s first national strategy for HIV, released in 1989. After a distinguished career in international development, she now lives in Canberra. Reid was a pragmatic idealist: with deep reservations, she nonetheless accepted the Whitlam government’s challenge to the women’s movement and worked to achieve change. Reid’s work reminds us to ask ourselves: What means can we use to achieve the ends we believe in? Today, in a political environment where so much of the gains made by the women’s movement are under threat, pragmatic idealism feels necessary again. 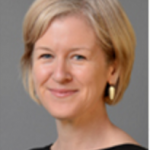 Elizabeth Reid will give the keynote address at the ANU Gender Institute symposium, ‘How the Personal Became Political: Re-assessing Australia’s revolutions in gender and sexuality in the 1970s’, on 6 March, see details here. 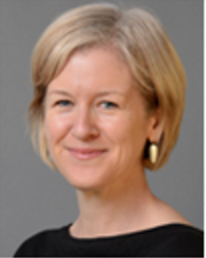 Michelle Arrow is an Associate Professor in Modern History at Macquarie University. In 2014, together with Catherine Freyne and Timothy Nicastri, Michelle won the NSW Premier’s Multimedia History Prize for the radio feature ‘Public Intimacies: the Royal Commission on Human Relationships, 1974-1977’. Michelle researched in Elizabeth Reid’s papers as part of her 2016 Fellowship at the National Library of Australia. Follow Michelle on Twitter @MichelleArrow1.